It’s hard to believe it’s been 3 years since we brought a small team of talented individuals together to set off on this journey. But none of this would have been possible without the thousands of customers who have put trust in us to deliver WordPress solutions which help them achieve their goals online. So as we celebrate our third year in business, we want to thank YOU for being the most important part of our success. Without you we wouldn’t be doing what we’re doing, so we are very grateful. 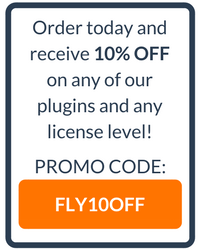 As we look forward to our next year of growth, we will continue forward with the model we’ve used so far to offer leading premium WordPress plugins which make your life easier. But It’s About You! So We Have a Special Gift! As our way of saying “thank you” for being part of our journey, we’d like to extend a special offer. Order any one of our two-site licenses within the next 72 hours and we will add a third site for FREE! Yep! One year of updates and support on three sites for the price of two! Hey, what can we say? We’re crazy about three! But you’ll need to be sure you act within the next 72 hours to receive this special promotion! Simply visit one of our product pages and you’ll receive a 3rd license for FREE! Once again, we want to thank every one of our customers and subscribers for putting your trust in us. We’ll continue to do everything we can to help you achieve your goals with your WordPress site.